Lance Franklin, Dan Hannebery and Jarrad McVeigh of the Sydney Swans. 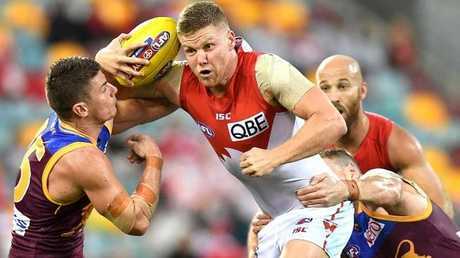 THE lure of returning to Melbourne and being closer to family is the motivation for Dan Hannebery wanting out of the Swans. 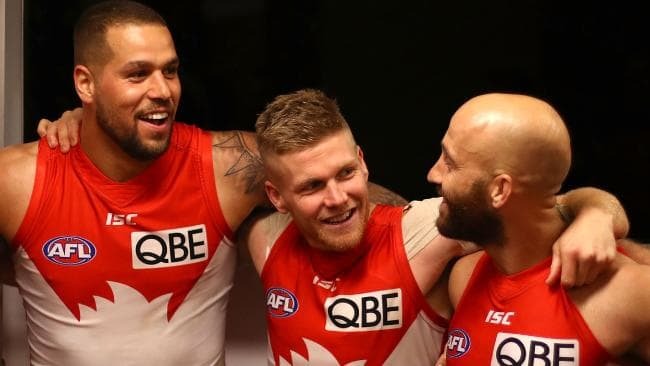 Speaking for the first time since Sydney revealed the midfielder wanted a trade back to Victoria, Hannebery said he could still stay at the Swans. But the 27-year-old wants to return to Victoria, his management dealing "exclusively with St Kilda". The Saints have tabled a lucrative multi-year deal for the hard-running midfielder. Hannebery said he believed in the Saints' list, saying: "First of all, they're not as bad as everyone thinks." "They've certainly got a lot better list than what many people think. Dan Hannebery in action for Sydney. "It might not be this year or next year they play finals … but I'm pretty confident they'll be pushing their way up the ladder." The Swans midfielder is set to be part of a trade after the Swans agreed to break a long-term contract. Sydney and the Saints are now haggling over his value, with St Kilda ruling out handing over its top draft pick. "At no stage did the club (Sydney) come to me and say 'Dan, we want you out'," Hannebery said. "I've always been really happy in Sydney … if I'm in Sydney next year that's great as well. "I've got a pretty strong family connection in Melbourne. I think it's time for a fresh start … both parties think it's a good idea." 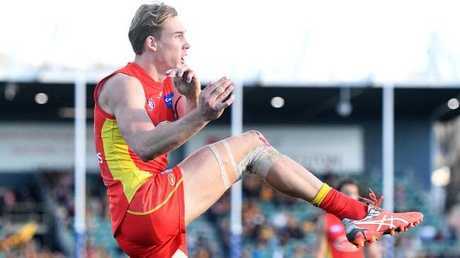 Former Gold Coast captain Tom Lynch says he has decided which club he wants to play for ... but he's not telling us. 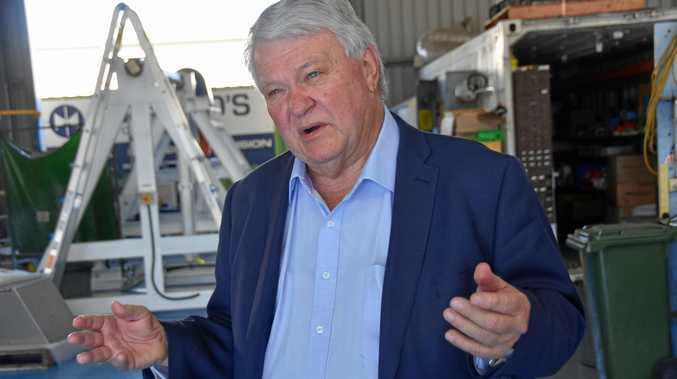 "I can't obviously say who I'm leaning towards at this stage," he said at the launch of AFL Trade Radio. "Out of respect to the clubs that I've spoken to, I'd rather let them know first and foremost." Lynch says he'd be in Melbourne at this time of year anyway, even if he were to stay on the Gold Coast. "I'd probably be down here at this time of year anyway if I stayed at Gold Coast," he said. "Still a few weeks to go before anything comes out ... it's not all done at this stage. "It's exciting to come home, I went to the Gold Coast as an 18-year-old." Tom Lynch in action for Gold Coast. Andrew Gaff's manager Paul Connors said plenty without saying a lot about the West Coast star's future. Gaff is reportedly weighing up a mega offer from North Melbourne but Connors wasn't ruling out the Eagles. "I won't confirm any of it (speculation about Gaff's future) but what I will say is money is no factor," Connors said. "He's been back in Perth for about 10 days and he's totally immersed in the football department. "Right now, he's totally focused on helping his team. He hasn't made his mind up." 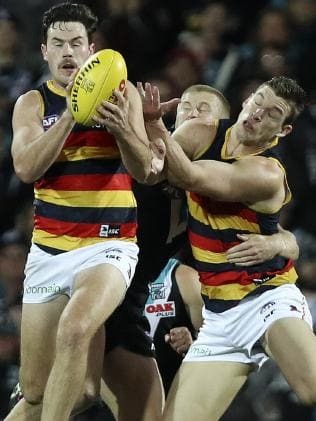 Adelaide gun Mitch McGovern is set to nominate his club for the future next week. McGovern's manager Colin Young revealed the Crow had been looking at four clubs; West Coast, Fremantle, Carlton and an unnamed fourth. "We're hoping by this time next week we'll have an answer for the media and club involved," Young said at the launch of AFL Trade TV. 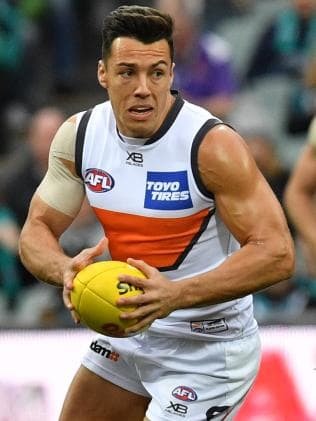 Dylan Shiel in action for GWS. The Giants star is being targeted by Victorian clubs with a $1 million contract offer reportedly in place. However, manager Paul Connors believed it was still a 50-50 proposition. "I wouldn't be surprised either way," he said. "He's contracted for another year but like all trades it has to work both ways. "He's either at GWS next year or in (Melbourne)." David Swallow: is committed to Gold Coast for 2019 and is considering a contract extension, according to Colin Young. Reece Conca: Fremantle has approached the Richmond midfielder's management but with the Tigers still in action, no decision has been made, according to Colin Young. Stefan Martin: Paul Connors said the star ruckman was "a lock" to be at Brisbane in 2019.